The third annual RIT Veterans Day Breakfast will be held Nov. 11 in RIT’s Gordon Field House and Activities Center. For Christine Moreno, serving in the U.S. Army felt like a great way to give back to the country and people that gave her opportunities. Born in South Korea, adopted at 3 months old and raised in Rochester, N.Y., Moreno has always sought out challenges and a sense of purpose. Moreno served eight years in active Army stationed in Mannheim, Germany (where she met her husband), Fort Drum, N.Y., and two deployments in Iraq. Her duties have varied from a wheel vehicle mechanic and security team member for a high-ranking leader to an instructor for an Army leadership course for newly promoted sergeants. Today, as a second-year ASL-English interpretation major at Rochester Institute of Technology, she is among a contingent of faculty, staff and students on campus with a history of service to our country’s armed forces. On Veterans Day, the university will take time to express its appreciation to these patriots. On Nov. 11, RIT will host its third annual Veterans Day Breakfast. 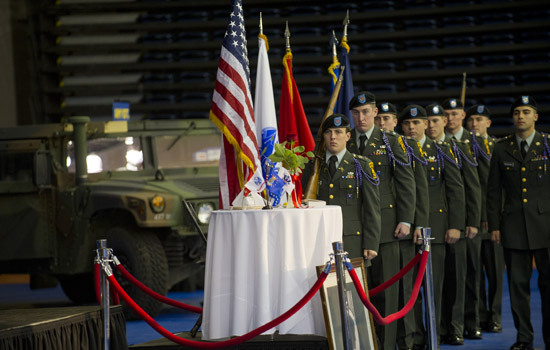 The celebration, scheduled from 8 to 10 a.m. in the Gordon Field House and Activities Center, pays tribute to individuals who serve or have served honorably in uniform. According to Barry Culhane, executive assistant to RIT President Bill Destler and chair of the event committee, RIT boasts a long history of accommodating the educational needs of returning veterans, dating back to the end of World War II. Members of the campus community who have relatives serving in uniform will also be acknowledged at the celebration. The program includes welcoming remarks from Destler and a videotaped roundtable discussion with several generations of veterans, including those from World War II, Vietnam, Korea, Iraq and Afghanistan. The film was created by RIT alumnus Stephen “Bud” Beikirch ’05 (film and animation). All members of the campus community are invited to attend the Veterans Day Recognition and Celebration. For more information and to RSVP, contact Amanda Rubacha at 585-475-7500 or amrpro@rit.edu.